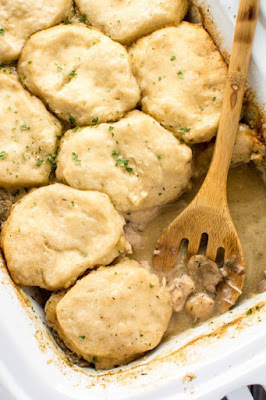 Here’s another delicious recipe using the Crock-Pot Casserole Crock Slow Cooker and this time we’re featuring this amazing-sounding Slow Cooker Chicken Gravy and Biscuits from Slow Cooker Gourmet. Click here to see The BEST Casserole Crock Slow Cooker Dinners! 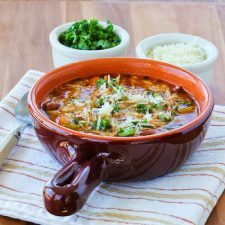 It’s time for another recipe idea that you can make in your Crock-Pot Casserole Crock Slow Cooker. This time I’m sharing a wonderful-looking recipe for Slow Cooker Chicken Gravy and Biscuits from Slow Cooker Gourmet. Don’t you agree that this looks like a great idea for a dinner that will be scarfed down by the entire family? Chicken, mushrooms, flour, seasonings and chicken stock cook in the slow cooker to make the chicken and gravy base for this casserole and then biscuits are added and cook for another hour until they’re done. I do want to mention that Jennifer used biscuits from a tube, but as she says in the recipe, you can certainly make biscuits from scratch if you prefer. And good for you if you make that choice; I’m sure this Slow Cooker Chicken Gravy and Biscuits be even more amazing with homemade biscuits! Get complete instructions for Slow Cooker Chicken Gravy and Biscuits from Slow Cooker Gourmet. Jennifer used the Crock-Pot Casserole Crock Slow Cooker for this recipe, and in the casserole crock you could brown the biscuits in the oven if you wanted, but you can certainly make it in a large oval 6 or 7 Quart Slow Cooker as well if you have one of those.